The 17’ fishing boat category is crammed with lots of consumer options and endless choices. 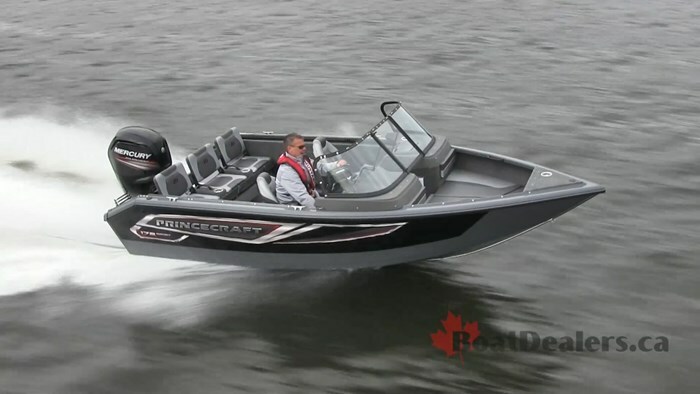 As a Canadian manufacturer Princecraft takes a direct hit at this category with several models – the Sport 172 is easily one of their most popular and it’s easy to see why this package is such a home run. 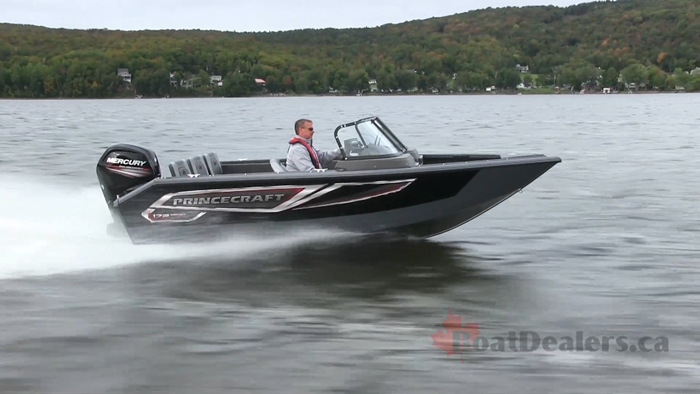 For 2019 Princecraft has raised the bar with a lengthy list of new enhancements to this already popular model. It all starts with a brand new exterior paint package that seamlessly brings the hull grey colour up and over the gunnel and virtually into the bow of the boat. At the dock the impact of this paint scheme is striking – and it’s even better looking on the water. The grey blends beautifully with the black on the hull sides and the deluxe decal package that our test boat was dressed in. There’s also a new blue for 2019 that I personally will be anxious to find come boat show season. The Sport 172 is built with a reverse chine hull and a deep draining splash well – what that means to you is the water is kept well away from the running surface when she’s on step giving you a drier ride. Any boater will appreciate the detail where the rigging tubes for bow or helm components are all neatly tucked under the floor in their own rigging tube – no more wires and cables dangling under the gunnel. 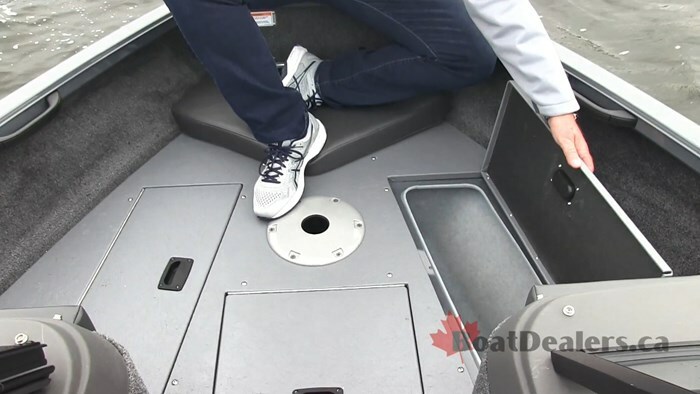 The bow casting deck houses a deep cycle battery storage compartment, an ice chest, one of the Sport 172’s six seat bases and a 30” electric filled aerated 64 L live-well. It’s here that we can accommodate your choice of trolling motor with a pre wired bow trolling motor plug with 60 AMP protection. 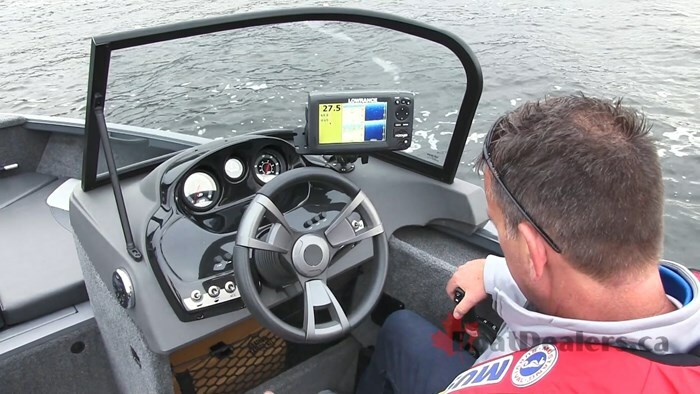 The cockpit of the boat is Canadian weather ready with a rugged and tall walk through windshield for early spring and late fall opportunities. 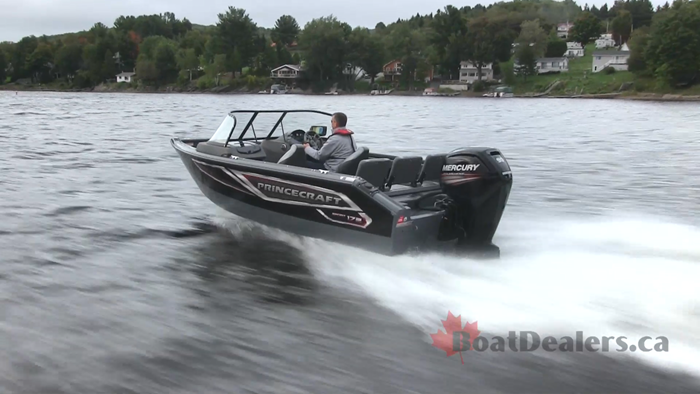 Princecraft knows the importance of a stand up height top with curtains that connect to the windshield and the rear of the boat - this is a common option for most Canadian buyers. The interior features two folding seats with no pinch hinges and the console is dressed in a deluxe dash panel. Storage with cargo netting was at the ready underneath both the driver and port side consoles. 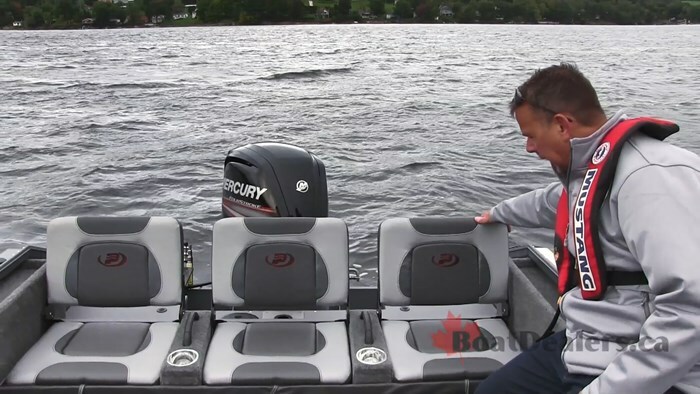 We found an in floor lockable rod storage compartment for up to 4 rods. The rear flip up full width bench seat has been totally redesigned for 2019. 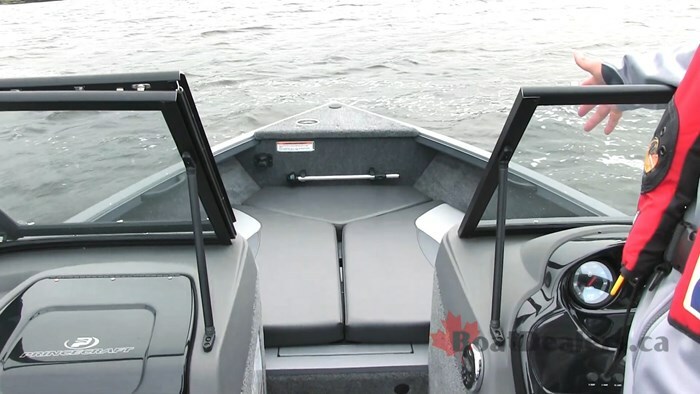 The 3 jump seats in the raised position are comfortable and there are plenty of grab handles available for younger boaters. The redesign team took the opportunity to shave some weight form the seat and it readily moves to open or closed with one hand. The electric filled and aerated stern live-well is 34” wide with overflow protection, an anti spill cover and an insulated lid. If swimming is part of your crews on the water game, the Sport 172 features a standard telescoping re-boarding ladder on the stern. Our test rig was also outfitted with a removable ski pylon making this boat easily convertible from a morning fishing machine, to an afternoon family play boat to even an evening cruiser. Two of us were on board on a blustery fall day with ambient air temps that had quickly fallen from 23 to 14 degrees C. With 3/8 tank of fuel the Sport 172 leapt on plane in a very nimble 3.20 seconds. We found GPS cruising speeds of 22.9 & 26.7 MPH with a reasonable amount of trim and our top speed recorded over several passes at 40.7 MPH. Our test boat was rigged with the Mercury 90 HP four stroke outboard and there is room to bump your package to a 115 if you’d like a little more go. For me personally I don’t think the Sport 172 needed more power as she turned beautifully in a variety of wave and water conditions on that chilly afternoon. All in all Princecaft’s Sport 172 is sporty, fun to drive, safe for my family and affordable package. 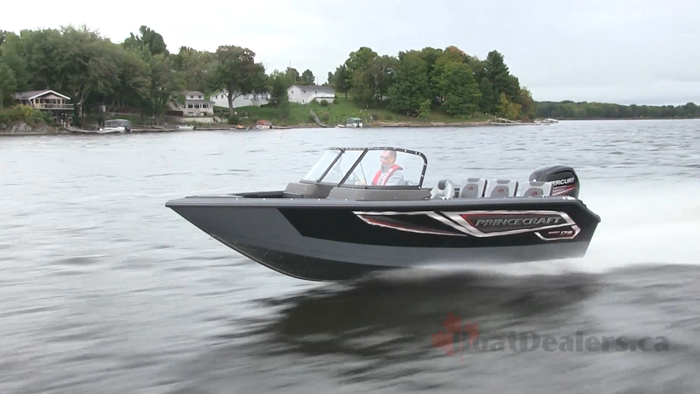 In a crowded space in such an important segment of the fishing boat market, Princecraft has done a superb job with the upgrades to the 2019 Sport 172.